The mission of the Irish Hooley is to promote Irish/Celtic music and culture in Dubuque.. For generations, the highlight of Irish social life was the Hooley with music, dance, song, good conversation and merriment. I would like to be a sponsor of the Irish Hooley! Shamrockin Since 2005! Irish eyes are smilin’ at the massive success of the Dubuque Irish Hooley Music Festival. None more than those who have benefited from the proceeds in the past years, including the Dubuque Fire Pipes & Drums, The Dubuqueland Irish, The Rotary Club, Hospice of Dubuque, Albrecht Acres, the American Legion Dubuque Post #6, the Presentation Lantern Center, the Julien Dubuque International Film Festival, the University of Dubuque Heritage Center, McNulty School of Irish Dance, Research for the Kids (RFTK), and the Ancient Order of Hibernians Dubuque County Division #2. Funds raised for charity and Irish cultural events in the 13 years since 2005 have topped $483,000. 12th Annual Irish Hooley Music Festival, Friday 26 August and Saturday 27 August, at the Dubuque Star Brewery and Alliant Amphitheater, featuring The Lads, Led Farmers, The High Kings, and Gaelic Storm. The Celtic Tenors holiday concert at the University of Dubuque’s Heritage Center. The 2015 JDIFF (Julien Dubuque Intl Film Festival) closing day on April 26 included “An Irish Sunday” sponsored by the IRISH HOOLEY. Our films shown at the 5 Flags Orpheum Theater (3pm to 6pm) included A Proper Pint by Dubuque native Keven Siegert and The O’Brien’s represented by 5 members of the cast and crew visiting from Ireland. The Irish Hooley then hosted the closing party at 6pm with music by the Madison-based band Kilkenny! It was great craic! 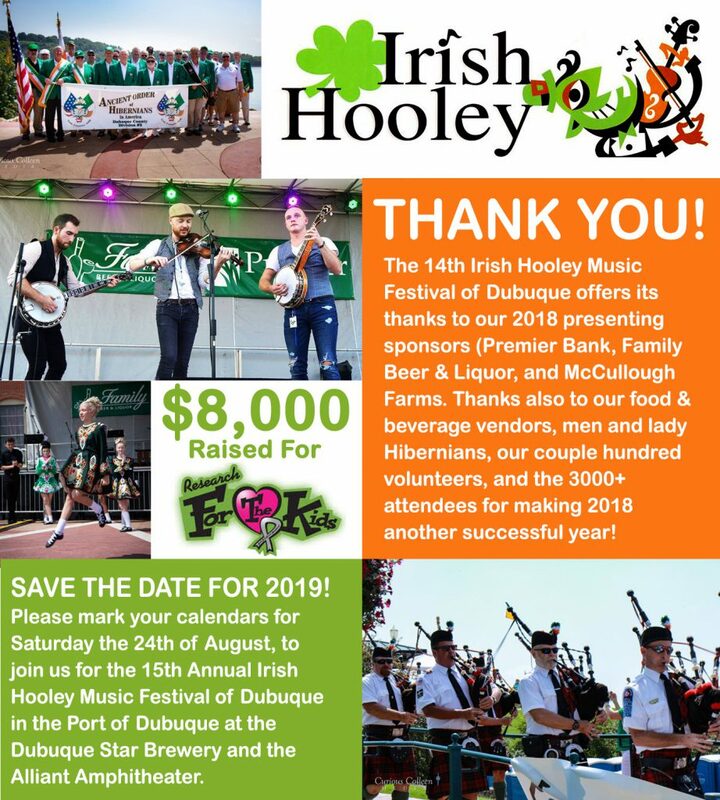 The Lads, Raspberry Lemonade, Dubuque Fire Pipes & Drum Corp.
Wylde Nept, The Lads, Dubuque Fire Pipes & Drum Corp.
Entertainment line up and band announcements for the 15th Annual Irish Hooley will be announced in March of 2019. Check back then.